Marketers have always relied on testing. But let’s be honest; it’s probably only in the last few years that they’ve begun discussing conversion rates rather than golf scores over beers. And yes, I’ve got the data to back that up. According to Econsultancy, in the last five years, the number of companies using A/B testing has more than doubled. Two-thirds use A/B testing, making it the top optimization method in practice today. Compare that to five years ago, when only a third of businesses were testing. You might say it’s the golden age of conversion optimization. Cool thought, I know. And it sounds like it should benefit businesses across the board. But that’s not what we’re seeing. Whenever any tactic becomes a “thing,” it gets adopted by newbies and wannabes. Beware. You could be paying good money for website optimization services from an agency that just learned last month how to run a test. The truth is, conversion rate optimization (CRO) is hard. You can’t learn it in a month, and you won’t be an expert until you’ve done it for years. A best practice is NOT the same thing as conversion rate optimization. PPC agencies, SEO agencies, UX, and UI people – they’re all claiming to do CRO. Here at Conversion Sciences, we’ve stopped doing best-practices consulting because it’s so unreliable. Even if someone asks for it, we won’t sell it to them. As brilliant as we are, when we implement best practices, we’ll be wrong on half of them. Every audience is different. You have to test to know what’s working. Period. End of story. Agencies fall into the best-practices trap. They hear something is working on another website, and adopt it, no questions asked. If a landing page built on best practices gets the results you’re looking for, call it dumb luck. When you rely on hearsay rather than data, it’s easy to make another mistake: Testing the wrong things. Some agencies try to shave expenses by cutting out the data-collection tools – things like click testing, heat maps, and user-session recording tools. As a result, they don’t have the data to make smart decisions about what to test. These agencies pick something out of the blue to test instead of using analytics to figure it out. Science should be based on hypotheses, not guesses or busy work. So, you should ask, if your tests aren’t based on data, what’s the point? Alex Turnbull, Groove’s founder, gives a great example of this. He lists some tests that are often considered “easy wins” (e.g., slightly changing the listed price or changing the color of a button); but for Groove, he says, those tests were pointless. Typically, those tests are the first tests newbies try to run, not because they’re relevant to the website or the audience, but because they seem like easy wins. Remember: Trust the data, not someone else’s results. Data is important. But you can’t depend on just any data. Self-reported data – such as responses from focus groups, user testing, surveys, and forum feedback – is gathered from people’s stories, not their behavior. They may not mean to, but they do. If you ask them how they spend their money, they give a best-case scenario or what they wish to be true. Not the absolute truth. Compare their answers to your analytics and you get another story. The real story. That’s why we don’t put much stock into self-reported data. Qualitative data (self-reported) is great for generating hypotheses, but it needs to be validated with testing. Agencies are time-and-materials companies. They bill by the hour. Understandably, they want every hour of their employees’ time to be accounted for and assigned to a winning project. The problem: This focus on the bottom line can dampen results. Scientists need time to be curious, follow their hunches, and understand the reason things are happening. A successful agency needs to give them that time, even if some of those hunches turn out to be pointless. In the long run, it’s cheaper to eliminate hypotheses early, before testing. In other words, a few hours of analysis beats two weeks of testing every time. Some agencies believe they have more job security if they make the client completely dependent on them. So they do it all – collect the data, make the hypotheses, and, supposedly, deliver results. Alone. There’s no collaboration with clients, which means they’re only using half the information they should be using to create hypotheses. Here’s the thing: The best results come when the agency and client work together. The agency has the expertise to collect the data, but the client has the intimate knowledge of the customer. It takes both. If your agency is doing everything for you, it may be creating issues rather than solving them. Similarly, some agencies appear to collaborate with the client, but they draw the line before influencing client culture. In reality, there’s a huge advantage to having an agency work so closely with you that it changes the way you do things. This is a biggie. An agency that doesn’t staff for CRO shouldn’t offer CRO. The best conversion scientists are skilled in two areas: They’re good with numbers and they’re excellent communicators. Getting high marks in high-school math isn’t enough. Conversion scientists are masters of data and statistics. They know when numbers are reliable and when they’re not. So they know how long to run a test and when the results are statistically valid. They know when the math is bad, which means you can be sure you’re getting positive results. Being good with numbers isn’t everything. Great conversion scientists are also excellent communicators. All too often, web developers are recruited to do analytics, and they understand the numbers … but not much else. At Conversion Sciences, the team members spend much of their time going through the numbers to tease out the stories. If there’s a hole in the plot, they design a test to figure out what’s missing. The goal is to find the story in the data — and tell that story well. Professionals test and validate everything before going live. That avoids costly mistakes like Finish Line’s 2012 web redesign, which cost the chain around $3.5 million in sales and a huge hit to its reputation. Four days before Black Friday, Finish Line launched a freshly redesigned website, supposedly planning to “reinvent the shopping experience.” Instead, customers complained about lost orders and other technology glitches, and Finish Line had to revert to the old design just prior to the holiday shopping season. My guess is that a brand agency was responsible for that redesign. It would have been smarter to work with conversion optimizers who understand how to use data to decide on incremental changes, validating each one before moving on to the next. Since CRO is now a “thing,” everyone and their office cat offer website optimization services. Most don’t know the difference between conversions and sales, which means they’re making a lot of mistakes. Now don’t get me wrong. We all make our fair share of junior mistakes when we’re starting out – things like delivering results without statistical validity, not analyzing traffic enough, and the like. But this is the golden age of conversion optimization. Don’t you want pro results? Again, not everyone who claims to be a conversion optimizer is. Unless your team is experienced and has a structured approach for improving conversions, it is likely making some mistakes that could be easily avoided — if the team was more experienced. Bottom line: Mistakes are more common than not. That’s because website optimization is hard work. If you want to get the big results CRO promises, you need an agency that has the experience and know-how to do it right. Period. As Brian, founder of Conversion Sciences, said earlier, the firm no longer offers best-practices consulting because best practices can be unreliable. For example, a best practice says videos are good and sliders or carousels are bad on the home page. Sliders distract visitors, are hard to read, yada, yada, yada. Not so, according to a DeviceMagic case study, published by VWO. The DeviceMagic test pitted a slider against a video to see which would work better on the home page. The team was pretty sure sliders were a better fit for their purposes, but it knew better than to make the change without testing. The verdict? The much-maligned slider was the clear winner. Conversions from home page to sign-up page increased 35% and subsequent sign-ups increased 31%. Costing £150 million ($226 million), the U.K.-based major retailer Marks & Spencer website redesign took two years and led to an 8% decrease in online sales. Based on the fact that the project took two years, it’s a fair guess that most decisions were made from self-reported data plus the design team’s own opinions. It’s unlikely A/B testing was involved because testing delivers incremental changes rather than one massive change. 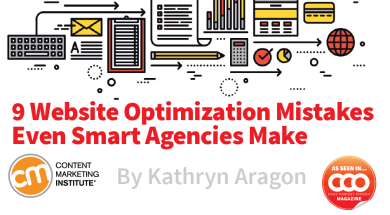 Kathryn Aragon is a content strategist and consultant on mission to help content marketers get measurable results from their content. Learn more at KathrynAragon.com. Follow her on Twitter.